In the clash of the titans, which is the one for you? Which flagship has you sailing for the mobile store? 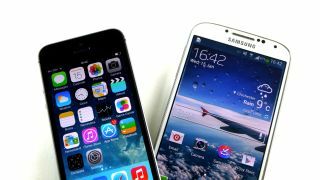 The Samsung Galaxy S4 and the iPhone 5S are devices that highlight the best of two of the largest tech companies at the height of their powers, so which one should you choose? Each handset has its own strengths, from amazing screens to epic cameras and a whole raft of different features that give each device its own personality. We've given each our thorough run through in our in-depth reviews, but if you're still a little unsure quite which of these exceptional devices is for you, then this guide is pretty much tailor-made for you. Gone are the days that the Samsung Galaxy range is accused of being iPhone-esque, with the Galaxy S4 looking quite a lot different than its Apple counterpart. The most noticeable difference between the Korean and American offerings is the size. The Samsung towers over the iPhone, measuring in at 136.6 x 69.8 x 7.9mm yet weighing only 130g. This dwarfs the iPhone at 123.8 x 58.6 x 7.6mm, but makes it 18g heavier than the 112g Apple. It is this smaller stature that makes the iPhone sit in the hand a lot easier, making one handed operation simpler on top of making it sit nicer in small skinny jeans pockets. Apple has followed a seemingly industrial style design with the iPhone 5S, the all glass black (or white) front is almost unbroken, with a subtle hints of the home button/Touch ID sensor, front camera and speaker. If you opt for the black front, space grey aluminium wraps around the side and the back, with more hints of the black glass present at the top and bottom. The white front options offer the choice of a silver or gold back, as well as a matching ring around the home button. Samsung, on the other hand, has produced a curvier handset, which also comes in black or white. A silver band around the home button, a silver speaker grille and silver Samsung branding help to break up the front, with the black and white front/back also coming with a faint textured look. A faux chrome band wraps around both versions of the Galaxy S4's plastic chassis. This construction aids in weight reduction and allows users to access the battery and microSD port, allowing heavy users that like to keep extra battery packs with them to swap them in and out, as well as able to keep multiple SD cards. Both the iPhone 5S and the Galaxy S4 come with the home button at the base, something that led to numerous comparisons between the original Samsung Galaxy S and the iPhone 3GS. Soft keys sit either side of the elongated home button of the Samsung, whereas, home button aside, Apple relies entirely on on-screen controls. Part of the reason for the size differences is just how heavily the screen dominates each handset. As with nigh-on all modern smartphones, the screen is very much the focal feature. The iPhone 5S comes with a 4-inch Retina display; a 1136 x 640 resolution resulting in 326ppi. Opting for a 'bigger is better' mantra, the Galaxy S4 comes with a 5-inch Full HD Super AMOLED display meaning a 1920 x 1080 resolution and a massive 441ppi. This added screen real estate means that it perfect for watching movies, or for playing one of the many games that grace the Google Play Store. Being Super AMOLED as well means that colours come highly saturated, although this can be toned down within the settings menu. There are many that continue to mock Apple for not (yet at least) building a larger iPhone, but equally there are many that feel larger devices are less suited to making phone calls and also doing things like browsing the web more easily with one hand. Whilst those looking or serious mobile gaming devices might assume the Galaxy S4 is the better choice, they shouldn't completely write off the iPhone, as even the smaller screen size doesn't spoil the fact it's excellent at graphical reproduction. The fight between Android and iOS is one that has been raging for a while, and is likely to continue for a long time into the future. Android is an open source OS, allowing users to customise to their hearts content. Don't like the keyboard? Download a new one. Don't like the home screen? Download a new one. Don't like the messaging app? Yes, you've got it, download a new one. Widgets also play an important part of the Android experience, allowing users to get a quick dose of information without having to load up individual apps. Fancy weather clocks, email, text, and social media widgets are now populating the Play Store. Navigation is done on screen, as well as through the two soft keys that sit either side. This aids the on-screen navigation, although at times makes the whole experience seem a little more convoluted. iOS is far more locked down, opting for a simpler icon experience. This means that iOS is easy to grasp right from the start, with navigation between screens and settings all done on screen. The only physical navigation button is the home button. Apple has also thrown in a Control Center, allowing you to control settings like screen brightness, Wi-Fi, Bluetooth and the torch with a simple swipe up from the base. This is very similar to Samsung's quick toggles that live in the notification bar, but is arguably more useful in some cases (well, just the torch really, but it's still a crucial part). One of the biggest selling points of the iPhone 5S has to be the 64-bit A7 chip that Apple has included. It stole all the headlines at the launch of the 5S, and has sparked many a debate amongst mobile enthusiasts. In the Galaxy S4, Samsung has included Qualcomm's quad-core 1.9GHz Snapdragon 600 chip, backed up with twice as much RAM as the iPhone, coming with 2GB. When using the Galaxy S4 and the iPhone 5S side by side, there is little to choose between the two. We found that both devices booted up in a very similar time frame, and moving between screens was also slick and smooth. Loading up apps such as the Calendar/S Planner, Phone and Messaging app were also done almost simultaneously. There did seem to be a more noticeable gap in loading larger apps, with the iPhone loading Youtube a little faster and leaving the Galaxy S4 standing when loading Sonic Dash, so it's worth noting that if you're after a more stable app experience.